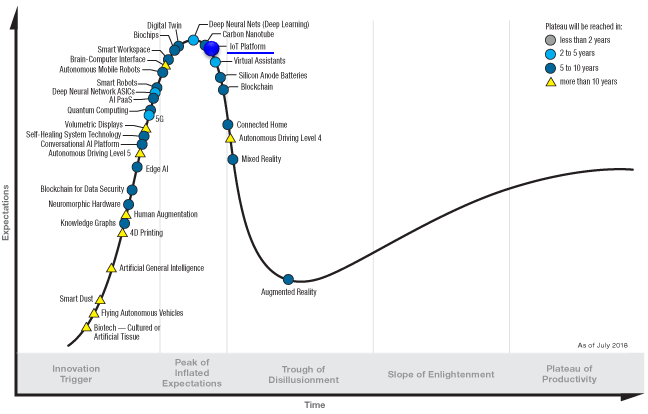 Even though I don't agree with exact time scale of the curve, but I am a strong believer of Hype Curve (Gartner) in terms of overall life cycle of emergying technologies. (If you are new to Hyper Curve, you can easily get explanation and tutorials on the web). According to my personal experience/observation on USB, Bluetooth, SmartPhone .. all of these has followed this curve. It is also a good stuff to kill time.. pick any item or industry that you personally are interested and google the path on the curve. 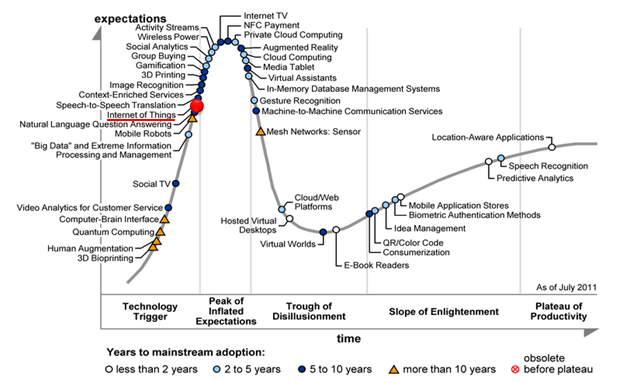 Following is the Hyper Curve for IoT that I found and I will keep updating as I find the latest. 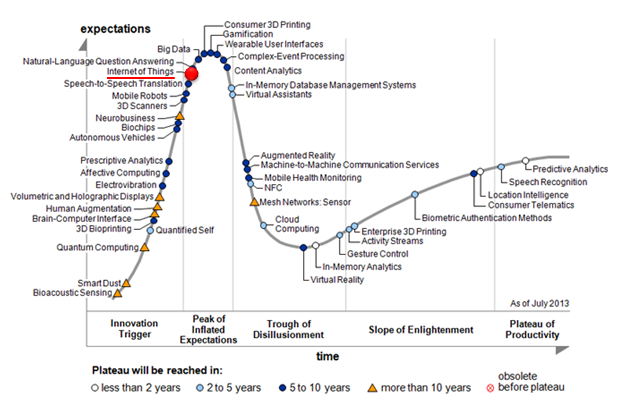 2011 is the first year when IoT shows up in the curve. Almost no change in terms of IoT. 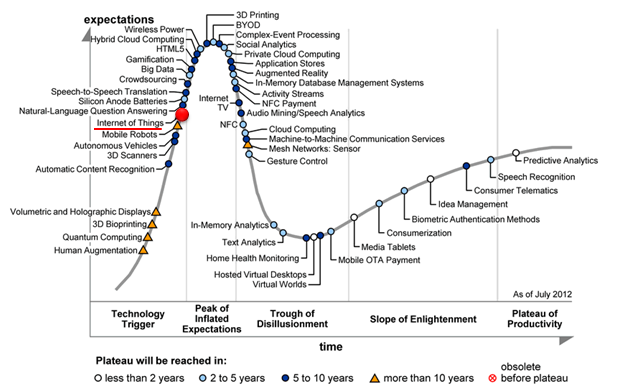 IoT picks up momentum and approaching towards the peak. 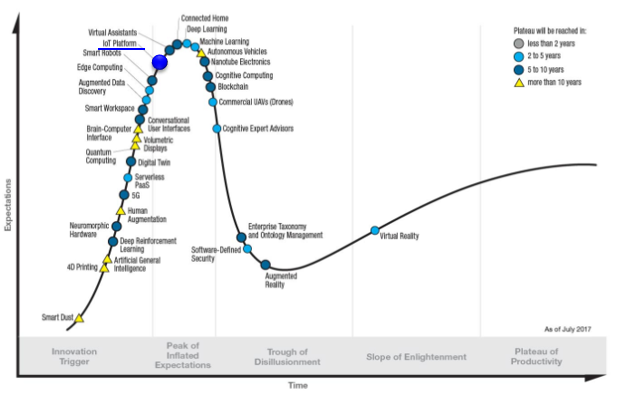 According to 2014 Hypercurve, IoT would have been expected to be a little sliding down, but it still stays on peak of the curve. Would it stay continusly at the peak and directly jump to Plateau ? or start sliding down gradually ? 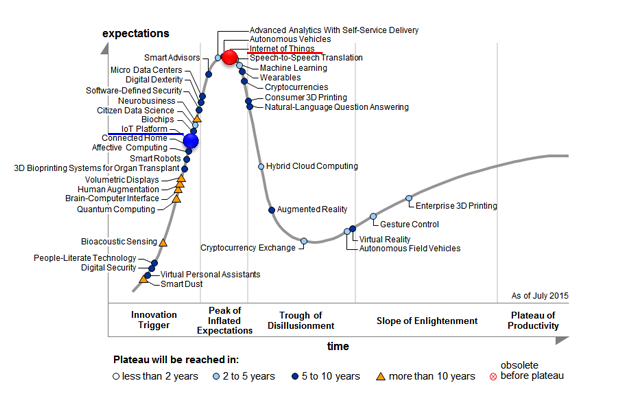 Note : A new word 'IoT Platform' is registered on the curve. Interestingly, the keyword 'Internet of Things' completely disappeared. The term 'IoT Platform' that registered last year is approaching the peak. Similar trend to 2016 except that IoT Platform got closer to the peak. Now IoT Platform is over the peak. Another way to foresee some near future would be to check Google Trend. Following is what I checked in Google Trend. The tricky thing is to figure out proper keywords that can best capture what you are interested in. IoT case this is even more difficult since there are too many words hovering around directly or indirectly indicating this area (e.g, IoT, Internet Of Things, Machine to Machine Communication, M2M, MTC etc). I just picked the two keywords that I think are the most common words and got the trend chart as below. Is it good timing, Now, to jump in ? 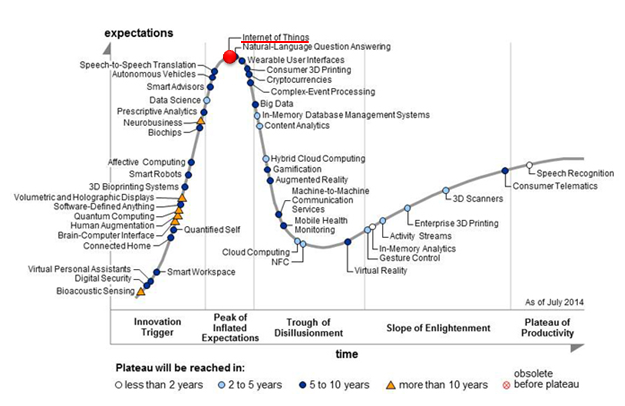 As of Now (Jun 2015), IoT is not at a good spot on the curve since it was already at the peak a year ago and I might have starting sliding down into long/dark tunnel of 'Trough of Disillusion'. If you are front end marketing/sales people who needs to make money right away, it would be not a good timing to step in because you would see almost nobody talking about this even before you have any tangible things to sell. But if you are on more strategic/long term marketing, it would not be a bad timing to get in. In many technology, most of R&T starts during the time when there is no hype/no fancy words/no buzzwords. It would be good timing to search and establish the relationship for the potential customer. By the nature of IoT architecture/eco-system, it would be highly likely that it is going to be 'long tail' market rather than conventional '80-20/90-10' market. So finding smaller but more customer will be extremely important in terms of product marketing. If you are a decision maker on the investment in a company, definitely you may want to wait until the mid/end of Slope of Enlightenment. I would try the same if I am a decision maker because you can minimize the risk for the investment. But it should not be like that for several reasons. i) If every company decide to wait until that point, the industry and ecosystem will never form and no chance to sell forever. Of course, the best strategy would be to let other take all the risk and you will get in the market when everything is clear... but that would be the area of high level game theory .. finding Nash Equilibrium ? :). ii) There is another reason why the decision maker should not wait too long. As you might have experienced, no technology can be implemented overnight however simple it sound like. If you start too late, you will be struggling for selling unmature product in the market and end up losing the whole market by the time your implementation is mature. My personal opinion ? 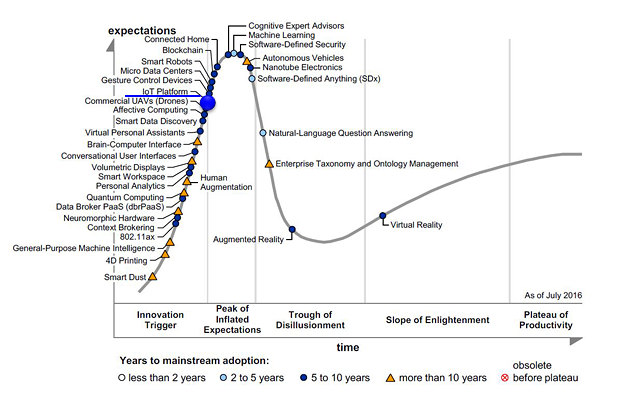 I agree with the hyper curve, but I am a little bit more optimistic in terms of time scale. Considering the accelerating nature of technical development, we may see a little early see the next phase than the current curve estimate. So many different types of embedded board and modules are available at very low price (You may easily get an embedded board to play with.. at a price of a fastfood meal). IoT module based on Cellular technology is still too expensive (When I say 'expensive', it means the price for single quantity purchase is too high). In case of GSM module, you may get it under 20 USD. However, you would need to spend at least over 50 ~100 USD for 3G. LTE based IoT module is not even readily available. Even when I have IoT end-device, it is still hard to find IoT platform that are readily available with super low cost or free and also with very easy interface.